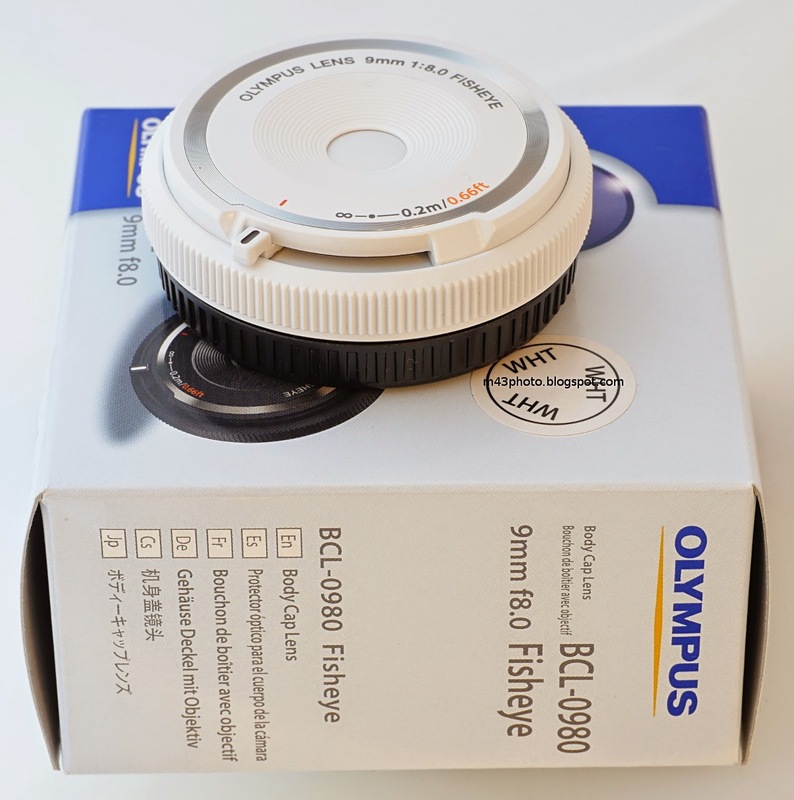 The Olympus 9mm f/8 fisheye is the second in the series of non-Zuiko branded "toy" body lens cap lenses. The first was the Olympus 15mm f/8. Both are very compact lenses, with a fixed f/8 aperture, and a small lever which operates a lens cap, and the focus. 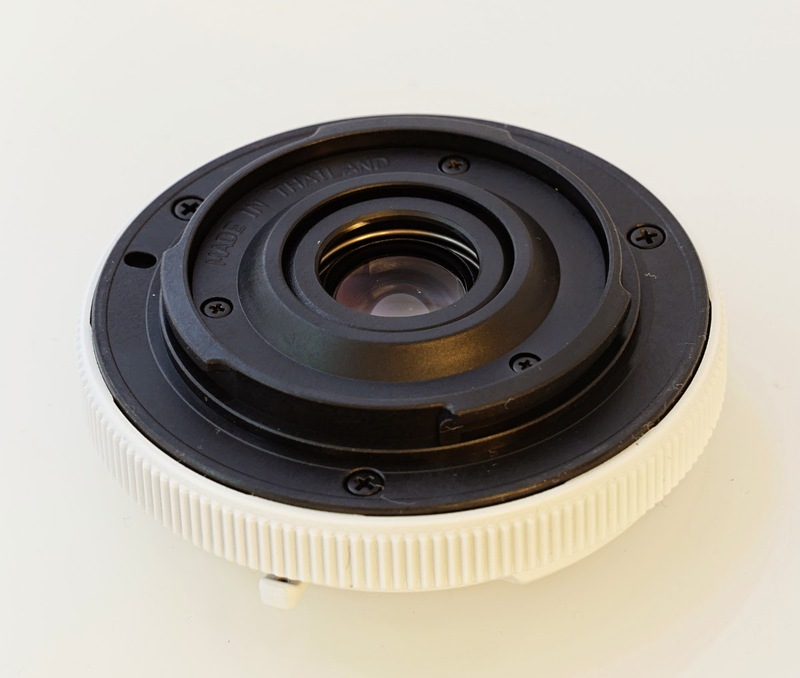 The lens is very light, and is made from a hard plastic material. Turning the lever on the front opens up the front lens cover, exposing the lens. Turning it further controls the focus. There are two "click stops" on the focus scale: One for "infinity", and one dot for "distant" focus, as explained in the manual. These two are quite similar in terms of focus distance. I would advice to use the "infinity" stop if you have no foreground items, and the second dot stop if you have some foreground objects. For focus closer than about 1 meter, you should start turning the lever closer to 0.2m. The lever is quite loose, and you easily risk knocking it out of place accidentally. If you change the focus, you'll see that the whole lens assembly moves back and forth. So this lens does not have an internal focus, is has a classic focus mechanism. On the rear side, you see that the exit pupil is much larger than the front entry pupil. This is probably to make the lens sufficiently telecentric, so that the light rays do not reach the sensor corners at a too steep angle. There is no serial number on the lens, and no electronic contacts. 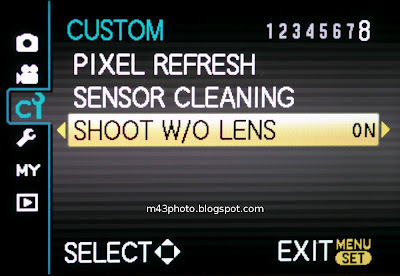 So to use the lens, you need to enable the "Shoot without lens" option, which tells the camera to allow taking pictures, even if it does not sense any electronic lens being present. The camera will still store EXIF data in your image files, however, the information about focal length and aperture is never passed to the camera, and will be missing when using this lens. The max aperture is f/8, which does not sound very impressive. However, for daylight use, this is perfectly fine, no problem at all. For indoor use, though, f/8 can be too dim. So indoors, you may need to use a flash. The Wanderlust Pinwide pinhole is similar in the sense that it is also a "fun novelty item", and is very compact, and wide. The Samyang 7.5mm f/3.5 fisheye lens is a very good fisheye lens at a reasonable price, one of the real bargains of the Micro Four Thirds system. 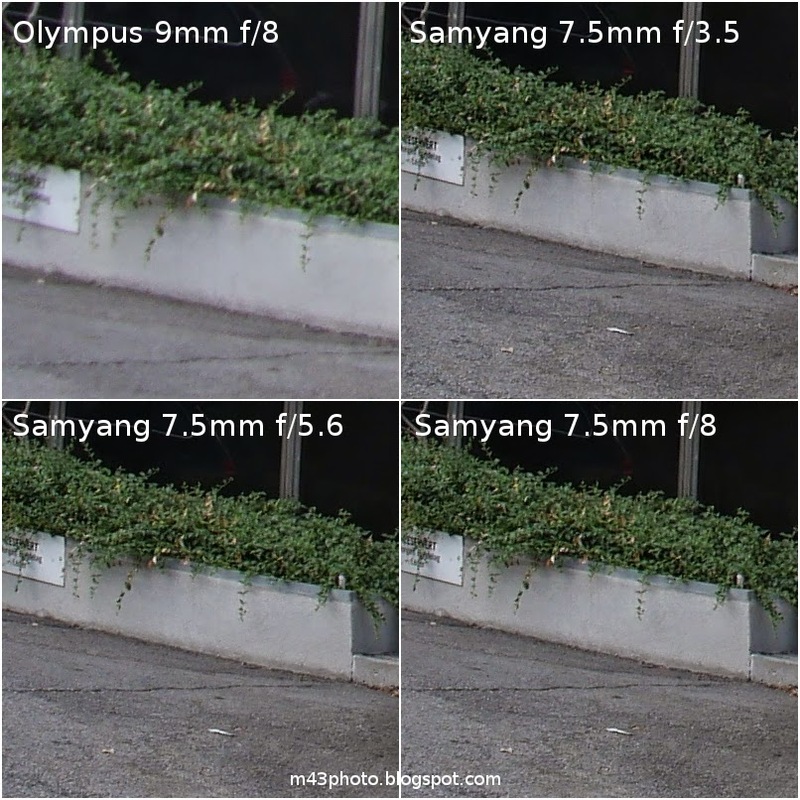 From these images, you clearly see that the Olympus 9mm f/8 fisheye is not a true fisheye lens: It doesn't have a full 180° diagonal field of view. The diagonal field of view is about 140°. In the centre, the Olympus 9mm f/8 fisheye is quite sharp indeed. However, in the corners, the sharpness is rather poor. But all in all, the lens is certainly fully usable. As you see, there is quite some flare, but it is not too bad. The flare looks quite ok, and even charming, one might say. Except for the fact that both lenses are very wide and have a significant barrel distortion, they are very different. 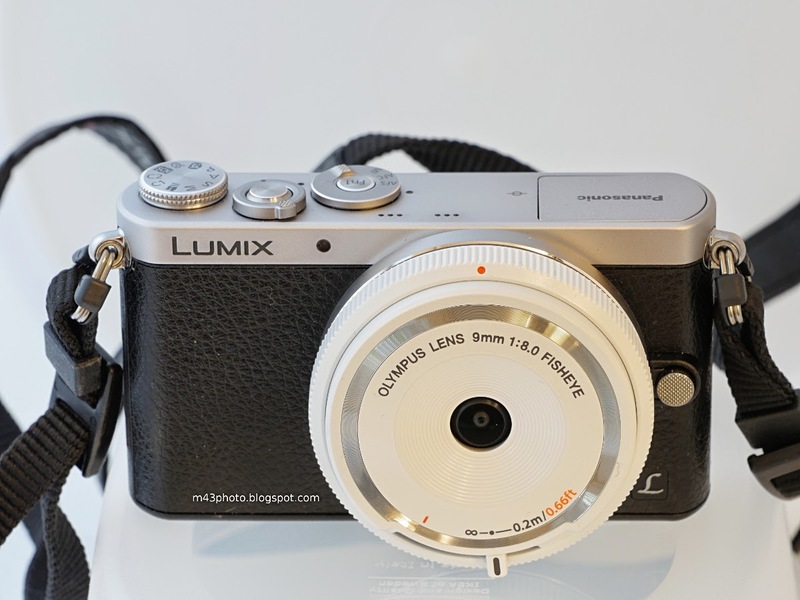 The Lumix G 8mm is quite expensive, around US$700. 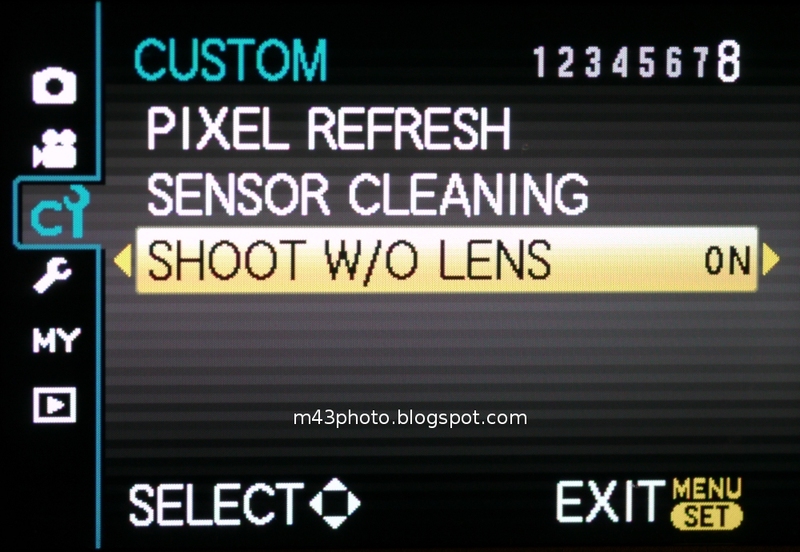 The Lumix lens has autofocus. However, the autofocus is normally not needed for a wide fisheye lens. Autofocus can come in handy if you are making cute closeup pictures of pets, but otherwise, it is not a big deal. The Lumix lens has a full 180° diagonal field of view. 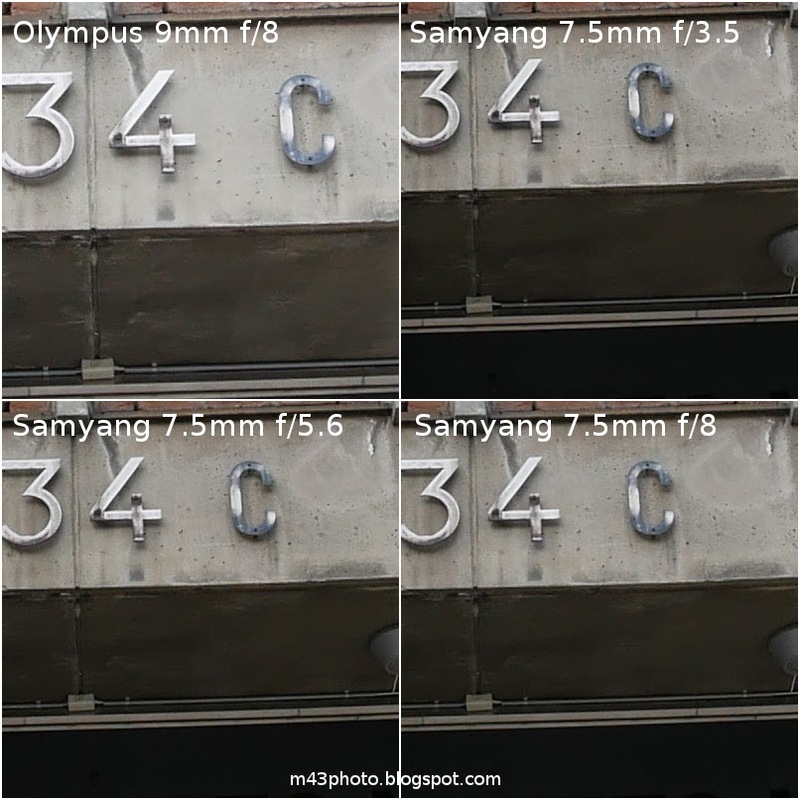 In terms of image quality, it is not quite as good as the much cheaper Samyang lens, according to my comparison. Also, the Lumix lens has slightly more barrel distortion, see a comparison here. To top it off, I also find that the Samyang is less susceptible to flare. 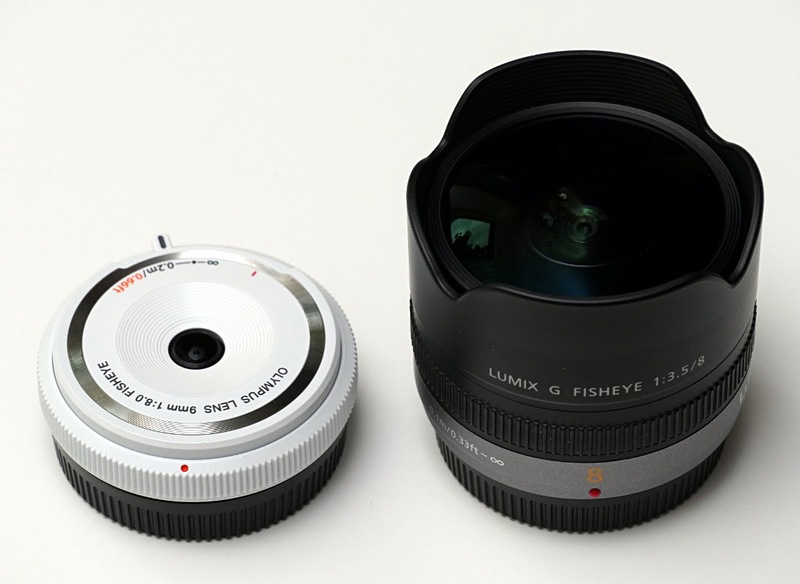 This makes the Samyang lens a good deal, and the Lumix lens less so. Using free software, it is easy to "defish" the fisheye images, i.e., removing the barrel distortion. See an example here, including a comparison with an image taken at 9mm with the 9-18mm wide zoom lens. 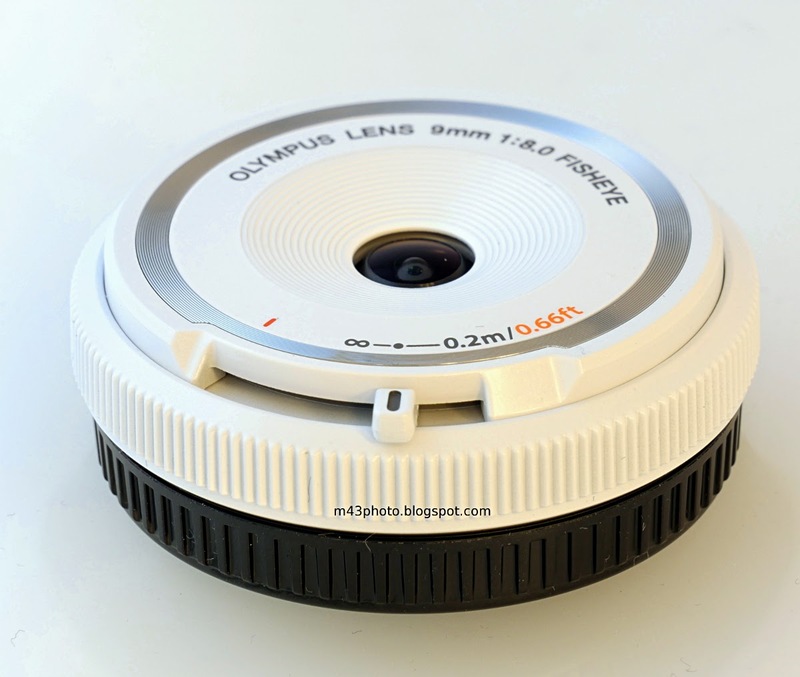 The Olympus 9mm f/8 fisheye is certainly an interesting lens. Mostly, it is interesting due to the size: It makes your camera very compact indeed. Optically, the image quality is ok, but hardly impressive. If you seriously want to test a fisheye lens, then I would wholeheartedly recommend the Samyang 7.5mm f/3.5 fisheye lens (my review), which has a much wider field of view, very good optical properties, and is easy and fun to use. The Olympus 9mm f/8 fisheye still has its place, as a fun, cheap, novelty lens, which takes good images. It is not a toy lens, I would say. It has normal glass lens elements, and two of them even have aspherical surfaces. These are JPEG images straight out of the camera, the Lumix GH4. Click for larger images. Here is a video recorded with the Lumix GH4. The first segment is done using 1080p, and the second at 4k resolution. With the extra 4k crop, the 9mm lens becomes a reasonably wide, almost rectilinear lens. In 4k resolution on the Lumix GH4, you barely see that there is barrel distortion, due to the camera cropping off the border. Most photography manuals classify any lens with an angle of view of 100 degrees or greater as a "fisheye" lens. Thus, the Olympus 9mm certainly qualifies, just as truly as the Samyang. I'll also report that you only need to choose a special mode on your Lumix. On my PEN, I just attach and start shooting. 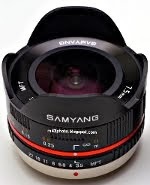 I have both this lens and the Samyang 7.5, love them both equally. Yes the Samyang is better is every respect but the Oly 9mm is so much fun, so light and so compact, oh and sooo cheap. It's a brilliant addition to the kit bag. As per the previous replies, i have said some very memorable results from this lens. Goes everywhere with me. And if using the Panny GM5 plus the Olly 9mm and Panny 12-32, i don't need a camera bag, just a coat pocket. Brilliant! Hugely recommended if A) you are on an extreme budget for an ultra wide lens on your micro 4/3 body. Pick one up for £30-40 on Ebay. Can't go wrong. B) you want something very light and very compact for your Pen or GM body. I like it and has a worthwhile place in the kit bag. Yes, it is a fun lens which is easy to bring along! This is simply wrong. Many lenses that shoot wider than 100 degrees are not fisheyes. For example, most 14mm lenses on full frame or 7mm lenses on Micro Four Thirds have an angle of view of around 115 degrees, and yet are rectilinear rather than full frame. I would like to know which "photography manuals" you are talking about. It is an awesome lens, especially if you find a bargain like I did for £20/$€25. Well worth setting up a watch on eBay for, or keeping an eye on used ones on Amazon for people not really needing a fisheye like me. It is definitely best cropped, when I crop I get really sharp and interesting photos. You can get quite creative with it. I just wish the 15mm had the same quality. It is rightfully known as the worst lens in the world. But if you have a GM camera these lenses make it pocketable. The 15mm is even thinner, maybe 3mm. But is only good enough to use with the special filters for some light hearted photography. My iPhone SE blows away the GM5 and 15mm. I havent compared but I think the 9mm would beat the phone except for the edges.